You are here: Home / Sermons / Sermons on Ephesians / Ephesians 6:10 – Power Up! Ephesians 6:10 – Power Up! Living the Christian life is one of the hardest things you will ever attempt to do. It is difficult to get yourself to church sometimes. It is difficult some days to open your Bible and read and study it. It is difficult to spend quality time in prayer with God daily. It is difficult to be faithful with giving the full tithe to the church. It is difficult to keep your thoughts pure and to keep your eyes on what is good. Living the Christian life is difficult. Have you ever wondered why? The answer is spiritual warfare. On a different note, let’s say you move into a new neighborhood, and over the course of a year, you get to know your neighbor a bit. He’s a nice guy. Has a wife and three kids. He’s a manager down at the hardware store, so you see him there whenever you go buy nails or screws. At certain times during that year, you need help with various tasks, and so every once in a while, you ask him to come by and help you out. And when he says he can make it, he comes. He helps you fix your plumbing leak. When you’re gone on vacation, he feeds your dog and collects your mail. You even had a BBQ, and invited him over to watch the game. Every time you ask him and he says he’ll be there, he comes. He looks at you and says, “Yeah, sure. That would be good. My wife and I were just talking about how we should start taking our kids to church.” Well, you’re just excited. You give him service times and directions and tell him you’ll see him at church in the morning. The first time you asked him to come, he said he would. And he has never broken his word. But the next day, he never shows up. The next time you see him, you tell him you missed him at church, and you ask him what happened, and he just evades the question by saying that something came up. But do you want to know what really happened? Spiritual warfare. The Christian life is hard to live because of Spiritual warfare. Evangelistic efforts meet with excuses and procrastination because of Spiritual warfare. And we could give numerous more examples. Christian families and marriages are under huge attacks today. Children are under attack. Churches are under attack. Pastors and church leaders are under attack. Even the Bible is under attack. All due to Spiritual Warfare. In saying this, I do not mean to say that marriages and families and churches and witnessing efforts are falling apart because of demonic activity. There is much more involved in Spiritual Warfare than a battle between angels and demons. Often times, our own sinful flesh is the culprit, or the wicked influences of this world. Satan and his demons are not the only ones involved in the moral failure of society. But we will talk about that in weeks to come as we look deeper into the great truths found in Ephesians 6:10-20. Today, we just want to show you how to get powered up for battle. Today we are going to focus primarily on our lives as Christians. This is where spiritual warfare beings—with us. We cannot be good soldiers for Christ in this battle, unless we are strong and powerful soldiers. So that is what we’re looking at today—how you and I can prepare ourselves for spiritual warfare. Before you can have victory in the world, you need to have victory in your own life, and that is what we will see today in Ephesians 6:10. Do you remember when Gideon went with his 300 men to face the Midianites? They surrounded the camp and after breaking the pots which held their torches and blowing into their trumpets, they all shouted out, “The sword of the Lord and of Gideon!” (Judg 7:20). That was a battle cry. And that is what we come to in verse 10. It is a rallying battle cry to spur us on toward victory. Ephesians 6:10. Finally, my brethren, be strong in the Lord and in the power of His might. Now, although this is a battle cry for all Christian soldiers, it’s not just something to get the blood pumping. It is full of richness and depth of meaning. As we will see as we look carefully at this verse today, it is a battle cry that is not just meant to spur us on in the heat of battle, but is also meant to spur us on in our preparation for the battle. We are “A Band of Brothers.” We fight side by side. We watch each other’s backs. We protect each other and defend each other. We go to the wall for each other. We march with each other. This is key for us to understand, and especially for us to practice. When you see another brother or sister in Christ who is facing problems, you need to come along side them and help them. See what you can do to serve and support them. In a battle, the heroic soldiers are those who stay and help the wounded get off the battlefield. Those who flee just to protect themselves are seen as cowards. As Christians, we are in this battle together, which means we must help those around us who get injured and damaged in the fight. We must come around them and give them the encouragement and support that they need. That is good to know in a war like this. It is good to know that we are not fighting alone. It is good to know that we have friends and allies. It is good to know that we are watching out for one another. That is what Paul means here by using those encouraging words, my brethren. So throughout this letter, Paul has been instructing us about how to live the Christian life, and now he comes to the final, summarizing instructions. Do you want to be fully prepared to live the victorious Christian life? Here, finally, is how to do it. Here, finally, is how to be fully prepared. And what is this final step of preparation? We need, according to the rest of Ephesians 6:10, our power. 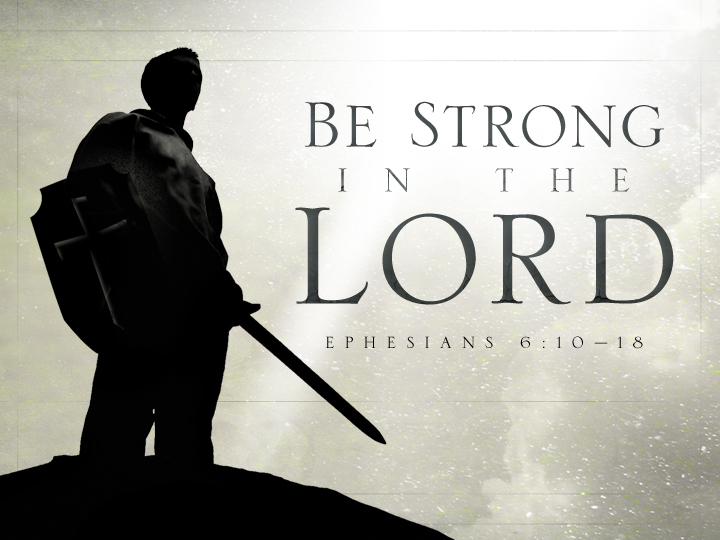 The second half of Ephesians 6:10 tells us to be strong in the Lord and in the power of His might. Verse 10 tells us that the power we get for spiritual battle is not ours, but God’s. It is given to us the moment we first believe in Jesus Christ for eternal life. At the moment we believe, all of God’s power and resources and strength and might are put at our disposal. In fact, this power from on high is a common theme right here through Paul’s letter to the Ephesians. In Ephesians 1:19, Paul tells us that the exceeding greatness of God’s power has been given to us who believe. And in Ephesians 3:16-20, Paul prays that those to whom he writes will know and experience the great power of the Spirit in their lives. Paul was not the only Biblical author to speak of such power. Almost every New Testament book speaks about the power that Christians have been given through the Holy Spirit living in their lives. So let me ask you a question. Why is it, if every Christian has this infinite supply of power available to us—that our lives do not reveal this power? Why is it that we don’t feel it, or experience it, or see it’s effects in our lives? Why is it that we rarely feel God’s presence in our lives? Why is it—if we have all this power—we rarely, if ever, see any evidence of it in our lives? Picture your life as a spiritual fuse box. No matter how much power is available, the fuse box only lets a certain amount of power through. If too much power tries to get through, or if there is a power surge, the fuses break. They don’t allow the current to flow through. And that is the way it is in our lives. We’ve got this infinite source of power over here in heaven, and this terribly dark and cold room that is our lives over here. But right in the middle, is this silly little ten amp fuse. And no matter how much power you pump into that fuse box, only ten amps are going to get through, and if you try to send in more, you keep experiencing the frustration of having your fuse break. But guess what? There is a way you can allow more power to get through, and that is what Paul means here when he says be strong. You can get a bigger circuit breaker. You can get a bigger fuse. You can let more power through. How? Well, to answer that, let me remind you of the overall picture of the section we are in. Paul is telling us about the armor of God. And the picture, as we saw last week, is that we are soldiers of Christ in a battle for the universe, against Satan and his forces. The picture then, is that we are soldiers. Now ask yourself. If a soldier wants to become strong and mighty, what does he do? That’s right, he exercises and trains and disciplines himself. Let me tell you how rigorous their training was. What sort of training and discipline and cultivation? After taking their oath of service, they were branded or marked with the letters SPQR, which was a Latin acronym showing that the soldier belonged to the “Senate and People of Rome.” Did you see the move Gladiator? He had this branded on his shoulder, and later tried to scrape it off so that nobody would know he was a soldier. Upon receiving this seal of ownership, they began their training. Perfection of their strenuous exercises helped the Romans be more disciplined, physically fit, and healthy than any other army of their time. They trained in any weather, and their training consisted of three categories—physical, weapons and field service. The most important of the three was the physical training. What good is knowing how to use a weapon, if you quickly got tired when using it? The physical training consisted mainly of marching. You think, “Marching? That’s not very physical.” Well, their marching was one step below an all out run. Their first goal in marching—when wearing all their armor—was to be able to do a military march of 20 miles in 5 hours. When they were able to do this without a problem, they increased their march to 24 miles in 5 hours. That is almost the length of Marathon in 5 hours, in full Roman military armor and with their pack. Other forms of physical training included the long jump and the high jump, running, carrying heavy packs, swimming and vaulting onto a horse. All of this (except for the swimming) was also in full armor. The weapons training consisted of teaching them how to use the swords and shields and javelins which they were given. Sometimes they would have mock battles to help in their training. The field service training was created to help familiarize the soldier with the battlefield conditions. First, they would perform a military march in full armor and with 17 days worth of food in backpacks. These marches were often performed in perfect military formation. The total weight of equipment and food was about 66 pounds. At the end of the march, they set up camp. Each soldier dug a ditch of specified width and depth, and then built a small stone wall around it. Another aspect of the soldier’s training involved his diet. Special attention was paid to the diet in order to keep the soldiers healthy and active. I won’t get into what a healthy diet looked like for them, for it hasn’t changed much in 2000 years. They were also trained in the areas of sanitation and personal hygiene. Again, much of what they practiced was surprisingly modern. There was much more involved as well, but I think you get the picture. Now think about this for a minute. What would have happened to the Roman army—or any army for that matter—which was content to let the soldiers just sit around and do nothing after they signed up? Imagine a Roman citizen going and signing up for the army, getting the brand on his shoulder, and then being told, “Go have fun. We’ll call on you when the battle starts.” Those soldiers would be decimated! But that is the way it too often is with Christians. People believe in Jesus Christ for eternal life, the receive the seal of the Holy Spirit in their lives, but then we tell them they can just sit around and relax. And then we wonder why so many Christians become decimated by sin and temptation. Why so many new Christians, after coming to church for a few weeks, stop coming, or lose interest, or go back to their old way of living. We shouldn’t wonder at such failures. We should take these new soldiers of Christ, and train them! Show them how to get spiritually fit. Show them how to use their weapons. Show them how to defend themselves. Show them what a spiritual battle looks and feels like. Show them what good spiritual food tastes like. Show them how to remain spiritually healthy. As Christian soldiers, these things are called the spiritual disciplines. The basic ones—for basic training—are Bible study, prayer, attending a Bible preaching church, and fellowshipping with other Christians. Those are just the basics, but sadly, most Christians never get beyond those. And that is why most Christians never experience God’s mighty power at work in their lives. 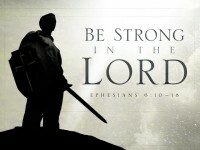 Paul says, be strong in the Lord and in the power of His might. How do you get strong so that you can experience the power? By exercising and training yourself in the spiritual disciplines. In fact, the word for be strong in the Greek here comes from the word dunamai which is where we get our word dynamite. But Paul does something very curious with the word here. He takes the word and adds a special prefix onto the word, which makes the word endunamao. In this way, the word doesn’t just mean strong, it means become strong. Grow stronger and stronger and STRONGER! And as we all know from physical exercise, the only way to become stronger and stronger is to keep working out, and pushing yourself, and exercising and lifting weights. You become strong in direct proportion to the time and effort you invest. That is exactly the way it is with the Christian. Do you want to become strong? It won’t happen automatically. You will only become strong in direct proportion to the time and effort you invest in practicing the Christian disciplines. And I would go even further than this. I would say that it takes more strength, and more discipline, and more courage to practice the spiritual disciplines than it does to become physically disciplined. It is harder to pray than it is to perspire. It is harder to tithe than it is to do Tae-Bo. It is harder to lift your Bible and turn its pages in Bible study than it is to bench press your own weight. It is harder to attend church services faithfully than it is to attend the YMCA. I know the spiritual disciples are difficult to do, but we must do them if we are going to survive the Christian life. If we are going to survive spiritual warfare, we must constantly be in training for battle so that we can become stronger. However, when we do these things, we need to remember that we ourselves are not getting stronger, nor is it our strength by which we are doing these things. Notice that the strength comes in the Lord and in the power of His might. So the strength and power and might is only in Him, and is only His. This strength comes to us from God as we exercise and train and discipline ourselves. As we engage in the spiritual disciplines of Bible reading, praying, attending church, tithing, evangelism, etc., we naturally grow stronger in the Lord and His might is able to work in and through us more easily. And in verses 11-20, Paul will explain in much greater detail how to prepare yourselves for battle. Putting on the spiritual armor is another way to grow in the strength of the Lord. So Ephesians 6:10 is a battle cry. It is a rallying cry. It is a motivational challenge. Wake up! Get up! Be strong! If you want to survive in this fight, you must get into the training. This week, pick some area of the Christian disciples that needs more exercise in your life and begin working on it. Read your Bible for five extra minutes a day. Reinvigorate your prayer life by praying through one Psalm every day. Decide to give the first portion of your paycheck to God. Take the plunge and talk about Christ with your coworker this week. It is only as you begin to work out spiritually that you will become strong in the Lord and in the power of His might. See in Snodgrass, The NIV Application Commentary: Ephesians, (335) all of the repeated phrases from the whole letter of Ephesians found in these 11 verses. Cited in Josh McDowell, A Ready Defense, 228. The verb is a passive imperative.